l was born in mexico city , my home town , l love my country and my roots , but also l love to travel , and visit new places and meet new people. Love has been my ultimate source in life, since many years ago, when l discovered that love is all that is around us, and if we really know this,our life changes forever!, we become happy beings sharing this love to the world! and that becomes our only purpose in life to be shining love to others around us , this becomes our life!!! We feel the unity in all, and this is what the new merkaba is all about, love and oneness!! l am also a meditation teacher and a healer, l have been teaching the living in the heart meditation for more than 7 years, and it has given me so much joy,l would love to share with you and your loved ones this world of love and harmony. Hola, este es solo un poco de información acerca de mi persona. Yo nací en la Ciudad de México, mi ciudad natal que amo, amo a mi país y mis raíces, pero también amo viajar y conocer lugares y países nuevos y conocer a personas nuevas. El amor ha sido mi recurso principal de vida, desde hace muchos años, cuando descubrí que el amor es todo lo que nos rodea, y si verdaderamente sabemos esto como real, nuestra vida cambia para siempre!!! nos volvemos seres felices al compartir este amor al mundo a nuestro alrededor!!! y eso se vuelve el propósito de nuestras vidas, irradiar este amor hacia otros alrededor nuestro, y esto se vuelve nuesrtra vida!!! y sentimos la unidad de todo en nuestro corazón. Sentimos la unidad en todo, y esto es de lo que se trata el nuevo merkaba, amor y unidad!!! 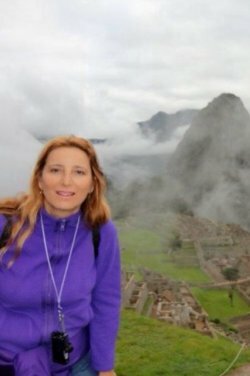 También soy maestra de meditación y sanadora, he estado enseñando la meditación de viviendo en el corazón por siete años y me ha dado mucha felicidad, me encantaría compartir esto contigo y con tus seres amados, este mundo de amor y armonía. Del 2 al 5 de mayo, 2019 en Ciudad de México. Schedule: 9:30 a.m. to 5:30 p.m. every day. With one hour lunch at 1:00 p.m.
Del 10 al 13 de octubre, 2019, en Mexicali, Baja California. Del 28 nov al 1 de dic, 2019, en Villahermosa, Tabasco. Adriana, i have no words that can express my gratitude and admiration to you, thank you! I love you ! Adriana was an awesome teacher, the hole event was beautiful and the information given is amazing. My recognition to that beautiful soul who was my teacher; Adriana Garavito for his great love and all the wisdom transmitted to us, as well as to his assistant Adrian. I took the awakening illuminated heart course and I am just fascinated and connected fully to God and his light and divine love. Please tell Drunvalo that I really thank him for all he has done to make this possible for many people. God bless him. My heart is really free of resentments. I received many answers, I knew why my mother had been so difficult to get along with my mom and received the answer that my father is not longer in this dimension (he disappeard many years ago) but I saw him in my heart. He was so happy and say bye. I met my Higher Self and many, many things like discovering that some of my mates in the course were old and loved human beings in former existences. Estoy muy agradecido a Drunvalo y especialmente a mi maestra Adriana , quien cuya sensibilidad me transmitio sensaciones , sentimientos y conocimientos que no imagine estuvieran en mi , muchas gracias ! los cuales hicieron un gran cambio positivo en mi vida . gracias !